Researchers in the US and UK have built a sheet of nickel with nanoscale pores that make it as strong as titanium but four to five times lighter. The empty space of the pores, and the self-assembly process in which they’re made, make the porous metal analogous to a natural material, such as wood. The advance from researchers at the University of Pennsylvania’s School of Engineering and Applied Science, the University of Illinois at Urbana-Champaign, and Cambridge University is detailed in Nature Scientific Reports. The porosity of wood grain serves the biological function of transporting energy. Similarly, the empty space in the researchers’ so-called ‘metallic wood’ could be infused with other materials. In one application, scaffolding infused with anode and cathode materials could enable the metallic wood to serve as a prosthetic leg that’s also a battery. The study was led by James Pikul, Assistant Professor in the Department of Mechanical Engineering and Applied Mechanics at Penn Engineering. Bill King and Paul Braun at the University of Illinois at Urbana-Champaign, along with Cambridge University’s Vikram Deshpande who contributed to the study. Natural metals have defects in their atomic arrangement that limit their strength, a situation applicable to titanium, which would be ten times stronger if it had perfect atomic alignment. Consequently, materials researchers have been trying to exploit this phenomenon by designing structures with the geometric control necessary to realise the mechanical properties that arise at the nanoscale, where defects have reduced impact. 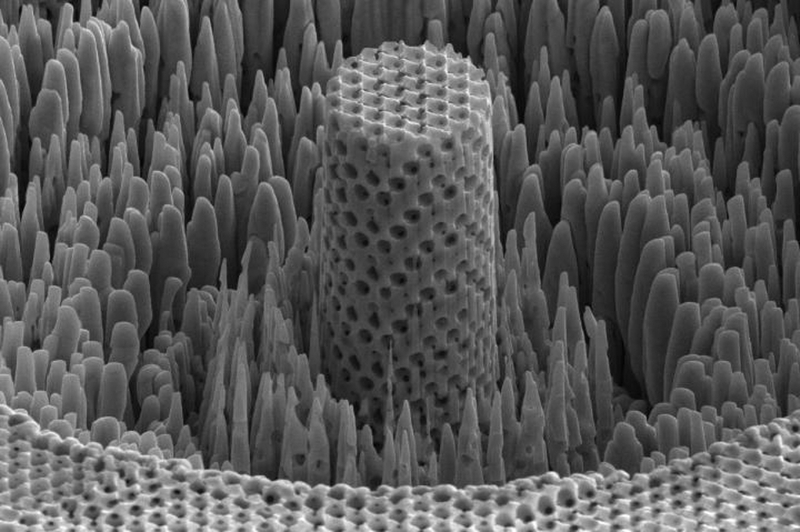 The struts in the researchers’ metallic wood are around 10nm wide, or about 100 nickel atoms across. Other approaches involve using 3D-printing-like techniques to make nanoscale scaffoldings with hundred-nanometre precision, but the process is hard to scale to useful sizes. Pikul’s method starts with tiny plastic spheres suspended in water. When the water is slowly evaporated, the spheres settle and stack to provide an orderly, crystalline framework. Using electroplating, the researchers then infiltrate the plastic spheres with nickel. Once the nickel is in place, the plastic spheres are dissolved with a solvent, leaving an open network of metallic struts. Because roughly 70 per cent of the resulting material is empty space, this nickel-based metallic wood’s density is extremely low in relation to its strength. Replicating this production process at commercially relevant sizes is the team’s next challenge. Size dependent strengthening through dislocation starvation is familiar to most stressmen, but the other mechanism quoted by the referenced article – porosity-based weakening, was new to me but philosophically understandable ( bending of micro struts) – very clever, shame manufacture seems limited to 1cm square , I could not resolve the third dimension so I will need to re-read in depth to better understand manufacture. Very novel and look forward to discussion on whether bulk manufacture could allow large scale structural applications.